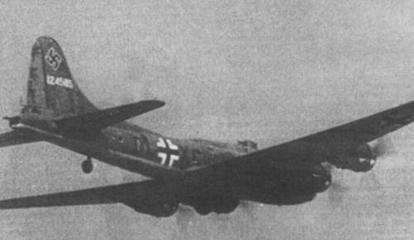 The first Boeing B-17 Flying Fortress bomber operated by German forces, in KG 200 markings. Several Allied and Soviet captured airplanes, such as the Mustang P-51, have been reported to have been flown by the German secret operations unit Kampfgeschwader 200 KG 200. This unit tested, evaluated and sometimes clandestinely operated captured enemy aircraft during World War II. Indeed, a group of P-51s were captured by the Luftwaffe as Beuteflugzeug (“captured aircraft”) following crash landings. These aircraft were subsequently repaired and test-flown by the Zirkus Rosarius, or Rosarius Staffel, the official Erprobungskommando of the Luftwaffe High Command, for combat evaluation at Göttingen. The aircraft were repainted with German markings and bright yellow nose and belly for identification. Originally established in 1934, the 2nd Test Formation, was reformed in 1942 under the command of Werner Baumbach. This unit was combined with 1st Test Formation in March 1944 to form KG 200 on 20 February 1944. On 11 November 1944 Baumbach became Geschwaderkommodore, all aerial special-ops missions were carried out by KG 200 under Baumbach’s command. Most of clandestine operations were performed from March 1944 when the KG200 was formed. Before the beginning of the war, aerial reconnaissance was usually carried out by civilian Lufthansa planes equipped with cameras. This practice was continued throughout the war as long as civilian airlines remained operational; later on, recon missions were most often carried out by Junkers Ju 86s flying at very high altitudes or by flying boats. Due to the lack of German aircraft with sufficient range, some recon missions used captured American B-17s or B-24s and Soviet Tu-2s. For the most part, these machines were used for re-supply roles (dropping in supplies to German forces operating behind Soviet lines), or transporting important personnel. Beginning in 1942, to compensate for its lack of heavy bombers, the Luftwaffe started to experiment with packing some of its war-weary Junkers Ju 88 bombers with enormous shaped-charge warheads and guiding them to their targets with a fighter airplane mounted on the back of the unmanned bomber. Although not as effective as the Luftwaffe planners had hoped, the Mistel program continued to be developed through 1944.The unit was originally intended to attack naval installations at Gibraltar, Leningrad or Scapa Flow in Scotland. In the last months of the war, a small number of high-ranking German officers pressed for a suicide fighter program as a last-ditch effort to stop Allied bombing runs over the Reich. This program, known as Selbstopfer (“self sacrifice”), was intended to use the Fieseler Fi 103R Reichenberg, a manned version of the V1 pulsejet cruise missile, to attack enemy bombers and ground targets. Several test flights were carried out by Leonidas Squadron KG 200, and mass production of the converted pulsejet-propelled missiles had begun, but the program was stopped due to intervention from Baumbach who felt that these missions would be a waste of valuable pilots. As part of the Aktion 24 operations, Dornier Do 24 flying boats were modified and loaded with explosives, with the intention that they would be landed on the Vistula River and exploded against river bridges used by Soviet forces. On 1 December 1943, a lone B-24 joined a bomber formation from the 44th Bomb Group. It was reported to have been a machine carrying the markings of a 392nd Bomb Group aircraft. However this unit did not become operational until 9 December. On 27 June 1944, a B-17 of KG 200, with Luftwaffe Geschwaderkennung code A3+FB, landed in Manises airport (Valencia) and was interned by the Spanish government. In July 1944 para-trained commandos of II./KG 200 carried out a parachute assault in July 1944 against French partisan forces on the Vercors plateau in the French Alps where hundreds of partisans had created a stronghold from which they were mounting operations against the German occupiers. These para-trained commandos of II./KG 200 remain a little-known arm of Germany’s World War II parachute forces and were listed on II./KG 200’s ORBAT (Order of Battle) as the 3rd Staffel. It is possible the paratroopers were actually Waffen SS paratroopers from the 500th SS Parachute Battalion assigned to Kampfgeschwader 200 for this particular mission. Beginning in early 1944 (perhaps as early as November 1943) the short-lived Operations Dora and Bunny-Hop took place in the Gulf of Sirte, Libya with secret bases inland at Al Mukaram and Wadi Tamet, as well as at Shott al Jerid behind the Mareth Line. These used a (long range) Messerschmitt Bf-108, two Heinkel He-111s, and a captured B-17 – given the fictional designation “Dornier Do 288″ – which despite being badly damaged during a raid on Al Mukaram by a Sudan Defence Force detachment, managed to return to Athens for repair. As well as local intelligence and meteorological work their aim was to ferry agents via French West Africa to Cairo, Freetown and Durban. On the night of 27 November 1944, KG 200 pilots Braun and Pohl flew a Junkers Ju 290 transport from Vienna to a position just south of Mosul, Iraq, where they successfully air-dropped five Iraqi parachutists in bright moonlight. The Luftwaffe crew flew back to the island of Rhodes, still under German occupation. After dealing with engineering problems, they evacuated some thirty casualties from Rhodes, reaching Vienna two nights later. The KG200 unit flew multiple types of German and captured allied aircrafts: Dornier Do 335, Arado Ar 232, Heinkel He 111, Heinkel He 177, Junkers Ju 290, Junkers Ju 390, Junkers Ju 188, Heinkel He 115, Dornier Do 24, Dornier Do 18, Arado Ar 196, Siebel Si 204, Arado Ar 240.